An exhibition of early colonial portraits titled HUSBANDS and WIVES has recently opened at the National Portrait Gallery, Canberra Australia. 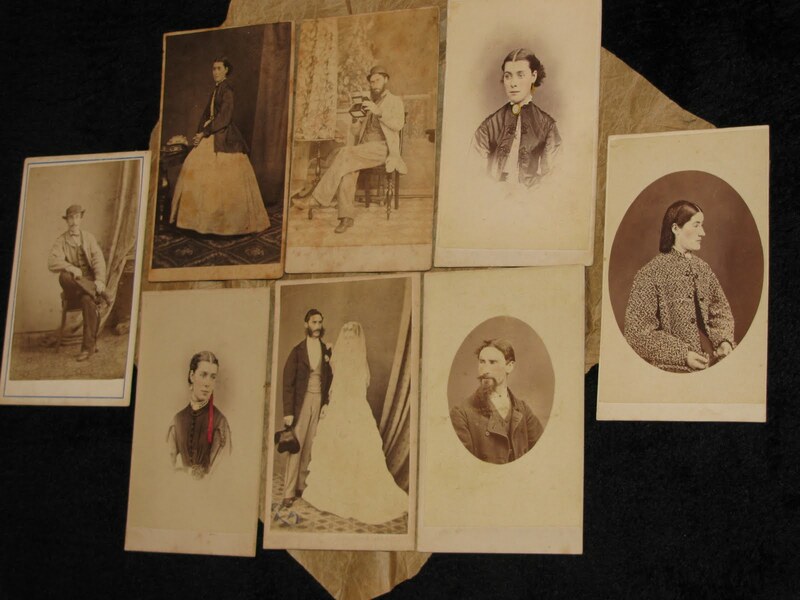 Apart from the usual collection of cartes-de-visite, there are several daguerreotypes and ambrotypes of individuals, couples and family groups on display, including the coloured ambrotype by Thomas Glaister, ca. 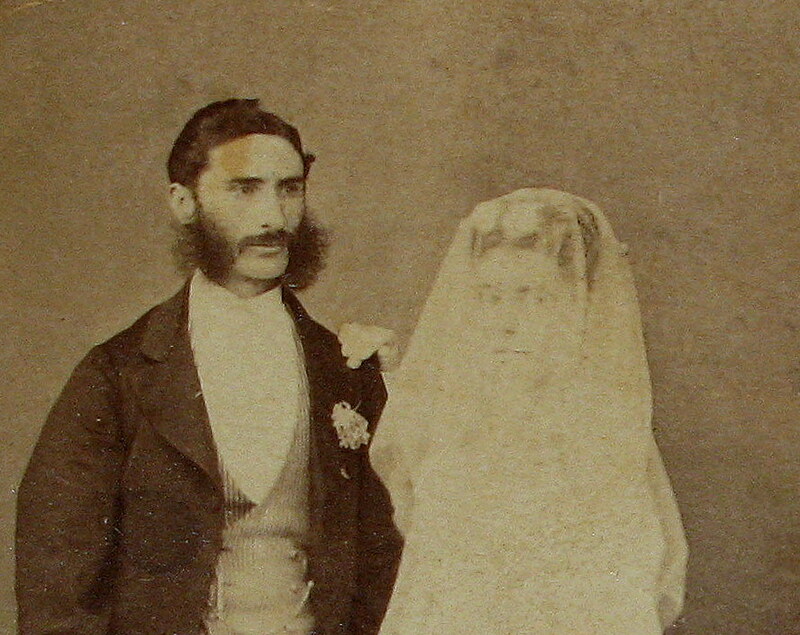 1858 (below, from the NPG online). 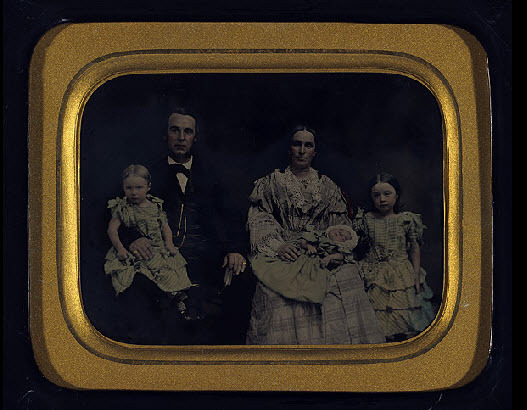 Ambrotypes typically have a dark background, and daguerreotypes typically reflect light from the metal on which the image is fixed, rendering these two types of photographs difficult to view in natural light; the former is often too dark and the latter too bright and mirror-like. They are even more difficult to appreciate in a gallery context which might maintain adherence to industry-standard lighting but which ignores the very special requirements of lighting, placement on walls or in cabinets behind glass, and distance at which the spectator is kept from these two types of early photographs. 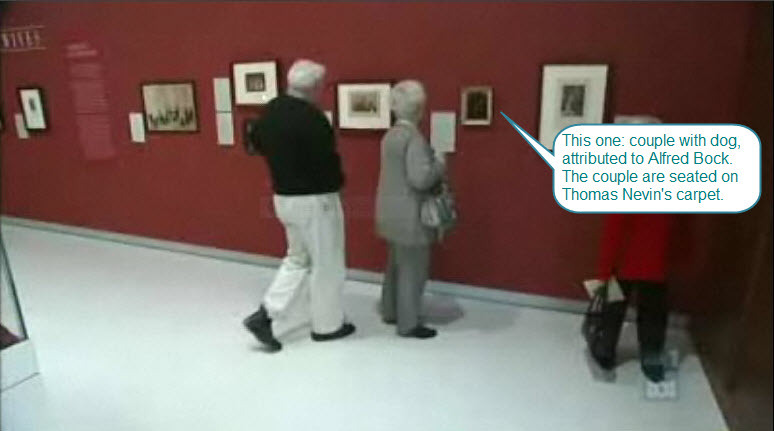 The National Gallery has made no effort to overcome these long-standing problems in this exhibition, resulting in a less than happy visitor experience. 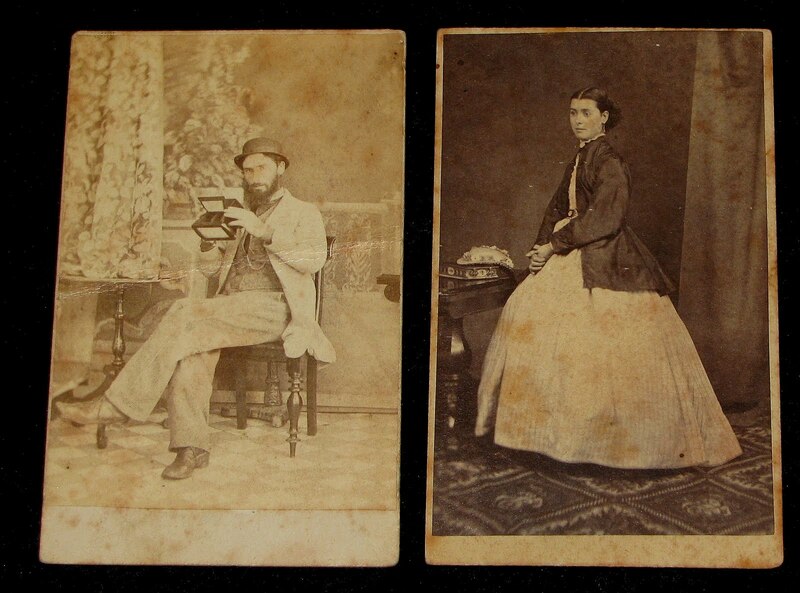 The carte-de-visite portraits below by Thomas J. Nevin of himself with stereoscope (1865), his fiancee Elizabeth Rachel Day (1865), and of his wedding day with his bride Elizabeth Rachel (1871) were not in the exhibition, but one photograph on display has a connection with Nevin. 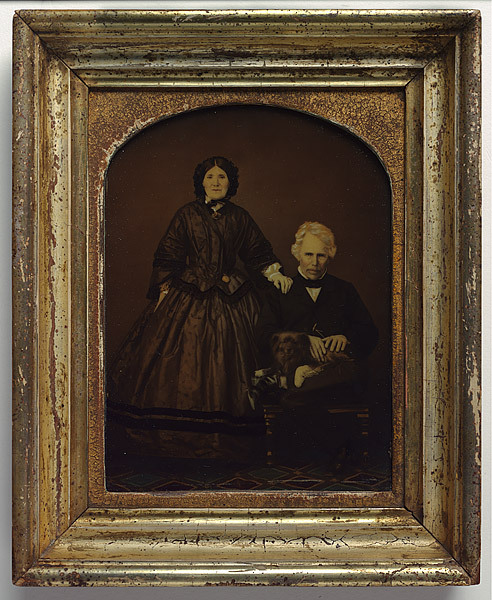 Titled “Married Couple with Dog” it features the carpet which Nevin had acquired from Alfred Bock by 1867, along with their studio and glass house at the City Photographic Establishment, 140 Elizabeth St. Hobart. The same carpet can be seen (below, right) in the solo portrait of Nevin’s fiancee Elizabeth Rachel Day, taken ca. 1865. Nevin began an apprenticeship with Bock in early 1863 and succeeded to the business on Alfred Bock’s sudden departure (due to insolvency) to Victoria in 1867. Above: TV snapshot (from ABC news item). Right: Elizabeth Rachel Day, ca. 1865 taken by Thomas J. Nevin. 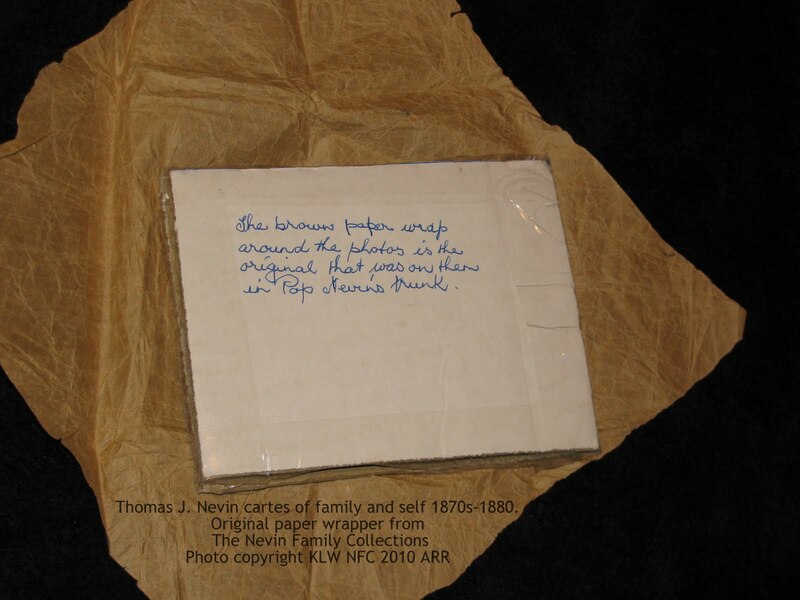 Photos and originals © The Nevin Family Collections KLW NFC 2010 ARR. 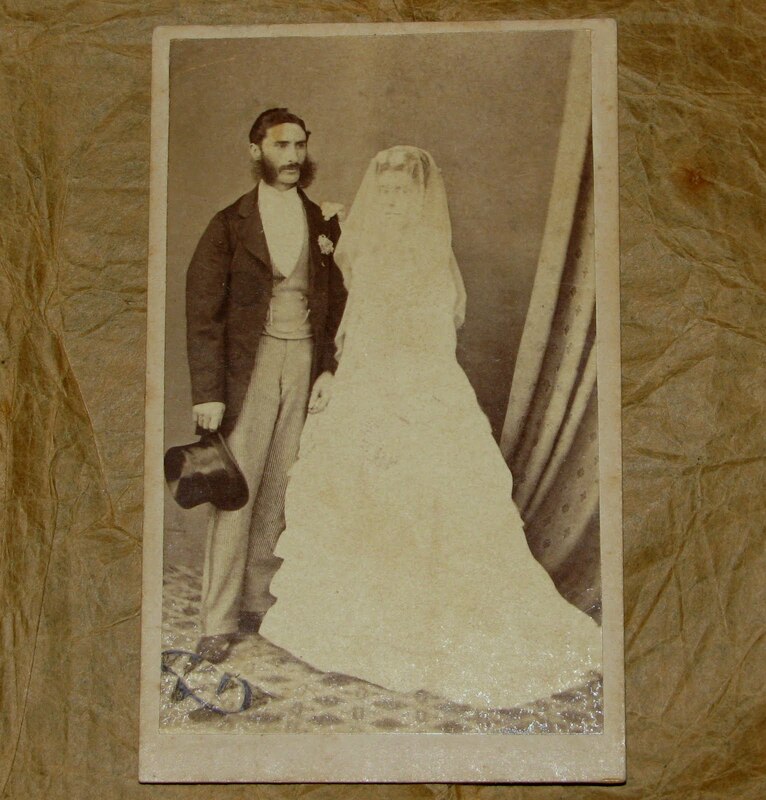 The NEVIN-DAY wedding photograph pictured here placed on the original brown paper in which the Nevin family have kept this carte and several others of family members by Thomas Nevin (below).